The most prolific flowering species, Wisteria floribunda lives up to its name with masses of flowers. Within this group bother flower color and the length of the racemes (the groups of individual flowers on a stem make up a raceme) also varies from 3o cm to almost 1m in length. The other difference between Wisteria floribunda cultivars is the strength of the perfume, some are only slightly fragrant, others have a heavy fragrance that will fill the garden. The species itself is a violet blue in color, however many cultivars are also available for sale. Varieties such as W. floribunda ‘Macrobotrys’ (syn. 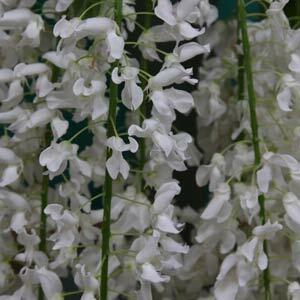 longissima) are often grown over high pergolas or tunnel frames. The long flowers of these varieties hang down gracefully and form a magical fragrant colourful tunnel. The best examples are in Japan, however in Australia you can see Wisteria archways and tunnels in places such as Alowyn Gardens in the Yarra Valley in Victoria. Good sun and a humus rich fertile soil are essential for good growth and flowering. Prepare the soil well by digging in good amounts of compost, aged cow manure and some blood and bone before planting. Take care to install a climbing frame before planting, plan where you want your Japanese Wisteria to grow. Dig a planting hole twice the diameter of the container, this gives the root system a good start. Plant, backfill and water in with a liquid seaweed fertiliser. For the first 3 years, concentrate on training your Japanese Wisteria. This is simply a matter of removing the unwanted side shoots and creating a main frame for the plant. Train upwards and outwards, leaving around 50 cm between main side stems. All wisteria can be propagated from cuttings taken in early summer. You can also layer a stem by attaching it to the ground, it will send down roots. W. floribunda alba ( syn. Shiro Noda) This is the white flowering species, only slightly fragrant, however it is the most famous of all. W. floribunda Hon-Beni (syn. rosea , pink ice) Pale rosy pink flowers, long racemes, very elegant. W. floribunda Kuchi Beni (syn. carnea) Similar to Hon-Beni flower color a little deeper, good fragrance. W. floribunda Lawrence Attractive lilies blue flowers, long racemes to 50 cm. W. floribunda Macrobotrys ‘Purple Patches’ Longest racemes we have seen, to nearly 1m, an old favorite. W. floribunda Shiro Noda ‘Snow Showers’ Later flowering than some others, white flowers with a touch of yellow, fragrance is mild. W. floribunda Violacea Flore Plena ‘Black Dragon’ (syn Royal Purple) Deep dark purple flowers, racemes are not really long but will still reach 30 – 40 cm. A stunning dark flowering cultivar. Over 20 varieties of including standards.